Have you ever fallen overboard when it comes to your eating plan? That is exactly what has happened to me over the past couple of weeks. I have not been taking the time to plan my day's meals... and not cooking real meals, but snacking way too much. I feel like I am drowning and really need to get back on board and make some positive headway. I have been at this healthy eating game for many, many years and I know that setbacks happen, but I get so annoyed with myself and feel like I should know better... why oh why do I keep making the same mistakes over and over again? This past year I have gained and lost the same 10 pounds more times than I would care to admit. I finally sat down and had a little chat with myself about why it's happened... and made some definite plans to set myself a new course of action. My why's are not likely the same as your why's and so insignificant really in this context... but I know that the things we need to do to climb back in the boat and take command of the helm are really common to us all. Here are 6 things I am going to do NOW.... today... They are positive and they give me a sense of control and yes, even hope. I am sure they will help you, too. Everyone has setbacks. Everyone. What happened is not really important. But what IS important is that we forgive ourselves and look forward. Think about progress not perfection. If you keep berating yourself you are setting yourself up for failure. Your thoughts become your actions. If you think you are a loser and cannot succeed, believe me... you will not succeed. Be as kind to yourself as you would be to a dear friend in the same situation. Think about how far have you come since you first started on this journey. What positive changes have you made? Maybe you have given up sugary sodas... maybe you have started eating more colors of the rainbow every day. You may have even lost some weight. Pat yourself on the back! Give that beautiful face looking back at you from the mirror a big kiss. This self-recognition and self-love is a huge motivator to keep moving forward. It might be low carb. It might be counting calories. It may even be Paleo or even giving up sugar. Right now for me it is carb cycling within my Weight Watchers Smart Points budget. I have reread my program material and readied my food diary for tracking and journalling. I have also made some plans for meals this next few days and done some shopping. Try to anticipate your next few days' activities and decide how you are going to avoid or navigate through the dangers. If you have good food in your fridge, you will eat good food. Get rid of the things that are not on your food plan. Hide them or donate them or even discard them if you like. Ask those people that you share spaces with for some help. If your husband loves Hawkins cheesies and you cannot handle being around them, ask him to eat them in another room, or offer him a substitute that he would be happy with. People will usually help if you ask them. I do belong to Weight Watchers so I can always go to a meeting or sign on to the web site to get support from members or leaders. But what if you are on your own? Well, I also join challenge groups on Facebook to help hold me accountable. I have had great success with some of these groups. If you use My Fitness Pal or Sparks People, there are supportive groups there as well. It is a good way to get tips and ideas for staying on track, and you might make some new friends as well. You can also use obvious hashtags on Twitter and Instagram to find like-minded people. #weightwatchers #paleo #vegan #sugarbusters are just a few that I know. If you think about why you fell out of the boat in the first place, you may learn some effective ways for preventing it in the future. For example, I know that I need to do a lot of planning to stay the course. If I push that aside and don't take the time to do it, I get into trouble. I snack too much, and on the wrong things. PLANNING is key for me. So, if you have fallen overboard and find yourself swimming with the sharks... get back in boat and set your sails for success! 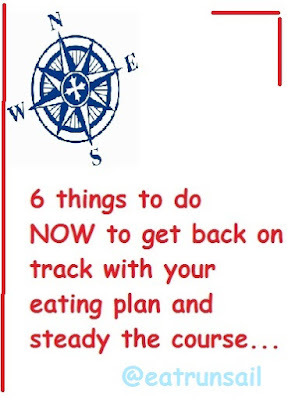 How do you get re-oriented when you stray from your eating plan? good tips! honestly, I don't stress about my eating. I love veggies and fruit and non white carbs naturally, and my regular routine is full of healthy habits but if I want a cookie or cheesecake, I'm going to do it. I workout 5-6 times a week and I think not beating yourself about it helps with staying on track. I know others may struggle though so easier said than done. Cleaning out your kitchen is key! There are certain foods I know never to bring into my house because they'll derail my healthy eating. Its natural for us all to go through phases where we veer off track a bit. But it sounds like you've got a great plan to help great yourself back on track. Keeping the junk out of the house is definitely key for me. I think that it's important to get to the root of the problem and work out from there. We all go through ebbs and flows with our activity and nutrition. It sounds like you have an awesome plan to get back on track! You'll be back to yourself in no time! Don't beat yourself up too badly...it's ok to fall off the track, as long as you get back on! So many great tips here that you are sharing! We try to keep a lot of healthy snacks-fruits and veggies on hand. Great tips. I'm hauling myself back on board myself. I've fallen so far overboard lately I think I'd need a submarine to salvage my eating plans, lol! Thank you for the great tips! I've been struggling ever since my son started playing travel soccer. It's been 6 months, so one would think I'd have gotten it figured out, but I can't seem to get my eating on track with the weird schedule two or three days a week. These are great tips! As I'm working with more and more clients I know that meal planning can be daunting and overwhelming and I've found that when people feel overwhelmed they tend to either under or over eat. My biggest goal when working with clients about food is to take away the good versus bad idea of food. Food is food! Good luck, sounds like you have a good plan to sail forward. I'm currently with WW and love it. It really helps me control my portion sizes and re-think certain food choices. Like yesterday I only ate one milano cookie bc it's 3 points and I used to eat half the package no problem! Now I reallythink about whether I want to use my points or extra points on junk food.